Call Hyundai/Kia! – Stop eating dogs! Home / What You Can Do / Contacts For Protest – South Korean Companies / Call Hyundai/Kia! – Stop eating dogs! South Korea’s Conglomerates (called “Jaebol”) have enormous power and influence over their government and people because they make up the majority of their economy and employ millions of people. While enjoying the profits from exporting their products and services to us, they are arrogantly ignoring our suffering and anguish caused by their heinous cruelty to the animals we love. It’s time they stop ignoring those of us who helped them live very comfortable lives. 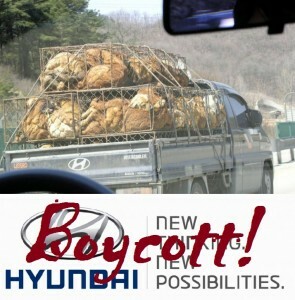 Please write to the S. Korea’s largest companies today! Without their participation, ending the dog meat cruelty in S. Korea is NOT POSSIBLE!Thank you! Click for Hyundai Companies in your country! USA Hyundai Washington Office 1-202-296-5550 1-202-296-6436 1660 L Street, NW, Suite 620,Washington, DC 20036 USA. USA Hyundai Motor Finance Co. 1-714-965-3400 10550 Talbert Avenue, Fountain Valley, CA 92728 0850, USA.